Damaged Goods –The Inside Story of Sir Philip Green. the Collapse of BHS and the Death of the High Street. Wow, what a read! Over the years, Philip Green has rarely been out of the news, but how much did I really know about the man behind the headlines? Truthfully, not a lot. True, I have seen him on the cover of magazines, watched him pose with model Kate Moss at fashion shows and envied him sunbathing on his enormous yacht. More recently, I read how Green, the owner of BHS, sold it for £1, and then, watched it collapse with the loss of 11,000 jobs and a staff pension deficit assessed at £571 million. But over and above the headlines, I have not given him too much thought; until now. This book, written by the financial journalist Oliver Shah, is a no holds barred expose of Green. Shah begins by plotting an overview of Green’s predecessors notably Charles Clore, who, from humble beginnings, wheeled and dealed until he was the richest man in the UK. Green followed in his footsteps. Once he started on Green’s story in earnest, Shah provided an interrogation of his childhood – hard working Jewish family made good; early adult hood – learning the trade of making successive business deals; marriage to Tina, who he later paid the controversial dividend of £1.2 billion to; and then a full account of his business career, his first business deal was accomplished when he was very young and truth be told he was often very successful (although his tactics were often questionable). Larger than life and sometimes cartoon-like supporting actors, drift in and out of the narrative, but everyone and everything is dominated by Green himself, although, his mother Alma gives him a good run for his money. Whether he is front stage with journalists, relationships with them can be characterized at best as ambivalent, one moment they are best friends, the next, enemies; or back stage brokering his next deal, the way he out smarts competitors and takes over numerous companies is fascinating yet disturbing (at Top Shop, one of his most prestigious acquisitions he is known to provide fashion advice! ), as was his attempt to buy M&S, which evolved into a genuine and real bust up with Stuart Rose. Fawning politicians don’t escape, David Cameron asked him to review public sector efficiency and Tony Blair gave him a knighthood. However, it’s all about Green and how he works everyone and everything, until he came a cropper with BHS. 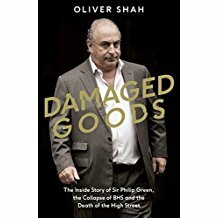 Shah’s book is immensely readable, thoroughly researched and vivid in its portrayal of the world of business a la Philip Green. My only criticism: it does get hard going when he gets into Green’s business deals and finances, which are complicated. It is much better when it reads as a blockbuster.